VIP : Very Important Picture! This might not seem like much, but as I was going through my photos trying to find something to fit the “Family Gathering” category to enter into the DuPage County Fair as well as a photo to work with the sketch I chose to use, when I came across this gem! This is a special picture because this is the only picture I have of my sister and I with out husbands, our dad and my kids, it was taken by my Uncle Bill who has quite the artistic eye and enjoys photography, and we are together at my Uncle Bill’s house to celebrate my Dad’s birthday. We are just not a family that goes for posed shots, but Uncle Bill got us together and I just think it’s fabulous! I’m so happy that it now has a place to live where others can see it, not buried on our computer’s backup drive! I used the Sn@p Life and Color Vibe collections from Simple Stories for all the papers and elements with the exceptions of: the banner title which is made up of cardstock from Paper Studio, stamps and ink from Close to My Heart, the font for the title word “Opportunity” was Cleanvertising cut with my Silhouette Cameo, the white lines were drawn with the Sakura Gelly Roll Medium white pen and the journaling was written with Sakura Pigma Sepia pen. 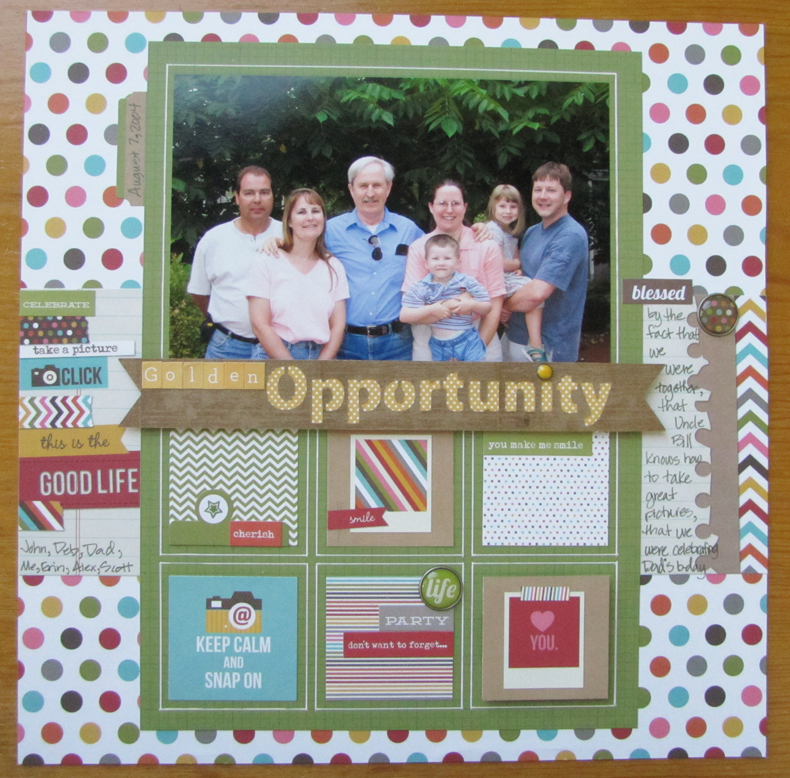 I am entering this into the My Scraps & More July Sketch #36 challenge and it was entered into the DuPage County Fair Arts and Crafts Scrapbook Page – Family Gathering category. Thanks so much for visiting! I hope you’ll take the time to write what you liked about my layout in the comments below! It really makes me feel very happy to read what you have to say!